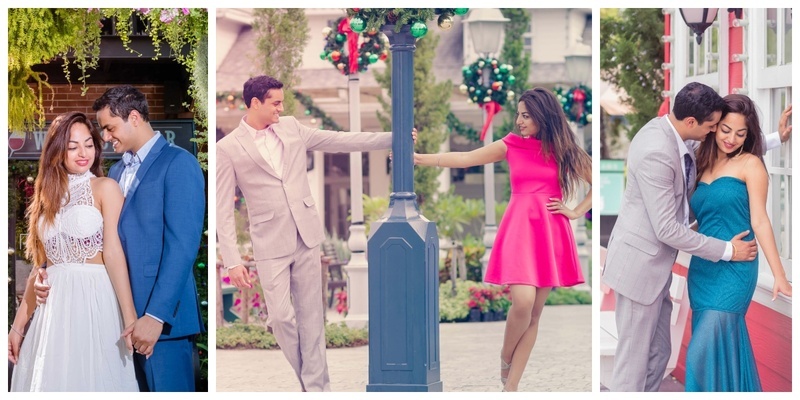 This beautiful pre-wedding shoot has the coolest couple outfit ideas! Sometimes you have to be at the right place at the right time for magic to happen. The beautiful love story of our international duo describes it perfectly. Our groom, Ketur comes from New Jersey, US while our bride, Simi is a resident of Denmark. Yet, with the pure work of fate, both of them happened to spend the same weekend in Miami. God certainly works in mysterious ways. They recently they got married in Thailand and their wedding pictures are just too beautiful! The bride in this beautiful blue fishtail gown reminds me so much of the pretty mermaid princess Ariel. Remember that awesome show ‘The little Mermaid’? This pink choker Barbie doll dress picked out by the bride was absolutely perfect for a serene minimalistic pre wedding shoot like this. Love is in the air indeed! Simi’s choker halter neck white lace dress is giving us some major gown inspiration! This pre wedding photoshoot showcased some of the most amazing city sight backgrounds, and we absolutely adore the bride’s fashion sense blending perfectly with it. The couple had a beautiful wedding ceremony in Thailand, and we couldn’t be happier for them!